Summary: The Jagoffery turned into a game show and where better to have a Valentine’s Day game show than the Arcade Theater with three Pittsburgh celeb couples? We welcomed KDKA’s Heather Abraham and her hub Frankie, WPXI’s Aaron Martin and social media maven wife Katie Love, and treasured couple Shelley Duffy and Paul Alexander. The sounds of Byron Nash made the Couple Of Laughs Game Show a star-studded YaJagoff event! Listen to the podcast by clicking on the PLAY BUTTON on the bar below. Don’t see the Play Bar above in your email? Click the one below to listen while you work, run through raindrops or Valentine’s Day shop! Question of the day: Best Valentine gift? Katie Love and Aaron Martin: Investigative Reporter for Channel 11 Aaron Martin and Owner of Love Social Media Katie Love join the podcast ready to win The Couple of Laughs Game Show in their whimsical banter and adorable love for each other. Hard-hitting questions come to the surface, but this couple knows who has the road rage in the relationship and who is always punctual for engagements. 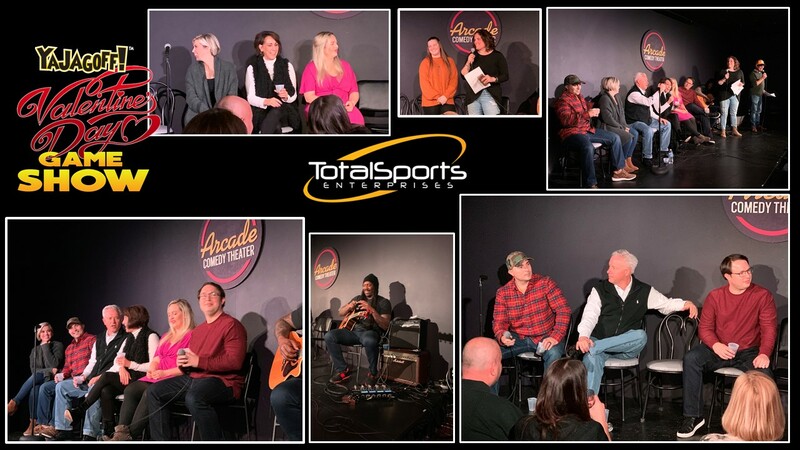 Who knew their first date at a steakhouse in Roanoke, Virginia would lead them to be fierce YaJagoff competitors in the star-studded event at The Arcade Comedy Theater! Shelley Duffy and Paul Alexander: Shelley Duffy, Pittsburgh radio and television personality and spokesperson for Treasure Hunt Jewelry, and Paul Alexander, sports broadcaster, and now with Sofranko Advisory Group, charm the audience with their bountiful love followed by hysterical laughs. From obsessions of vacuums to peanut butter filled pretzels, the lovely couple knows how to take care of each other, as well as giving it their all to win the competition. Heather Abraham and Frank Trabucco: KDKA-TV Anchor and Pittsburgh Today Live Host Heather Abraham and her husband, firefighter with the Pittsburgh Bureau of Fire, Frank Trabucco, join The Couple of Laughs Game Show excited even though their answers to each couple question may have different outcomes. Find out who really loves shoes in their relationship and what treasured item they could not live without in case of a house fire. Either way, the couple knows how to express their undying love through iconic jams and impressive dance moves. 28:25 The guys are back. How did the ladies do? 48:24 The Ladies are back. How did the guys do?